These guys are excellent!!! Did a great job on our bar and other stuff and the finishing work (stain) was outstanding! Cannot say enough about them! 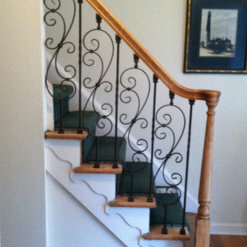 This company did an excellent job in fabricating stair brackets for my very, very old house. The sales department worked diligently with me as I refined the draft measurements, and the final work product, which consisted of 14 brackets, was of a superior and consistent quality. As an added bonus, not only was the the total cost was entirely reasonable, but the company arranged to have the brackets delivered by hand. I purchased a large quantity of crown, base and jamb moulding and couldn't have been happier with the professionalism of Carol and her team. 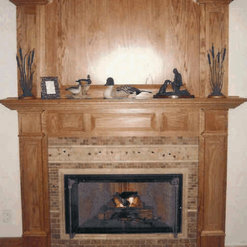 The material is beautiful, fabricates well and enhances the home overall. My home is in Virginia, I could not find better pricing, finer stock or better people to deal with, across the 300 miles from Eastern Shore VA and central NJ. I cannot say enough about the workmanship of the bar and back bar we had built!! Absolutely beautiful, it is built amazingly well. The Wood Works made us a custom entertainment center. Very pleased with the whole experience. I would recommend to anyone looking for real craftsmanship. This store is fantastic and after going to several place, this was the ONE place that was about to make custom pantry doors for me matching my kitchen cabinets. 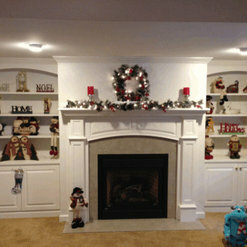 They were done quickly and professionally and they look absolutely fantastic. I'd recommend them to anyone. Very helpful and professional. Will definitely be back when I decide to change out my fireplace mantle. I will recommend this company to everybody. My wife & I wanted a bar for our basement and went to the Wood Works. We were referred to from a friend. They were so helpful and had many bars on display at their showroom. 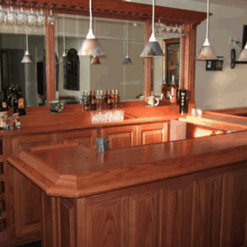 We got an oak bar and a back bar that met and exceeded our expectations. Sales staff was helpful and prices were very acceptable.